Kathryn Lake Hogan, of LOOKING4ANCESTORS offered a Fun Friday challenge that dares us to comment on at least 10 blogs – some favorites and some new. So I urge to you go check out these blogs and the posts and please leave comments where ever you visit! Care to leave me a comment? My dad remembers his mother’s youngest brother with fondness. 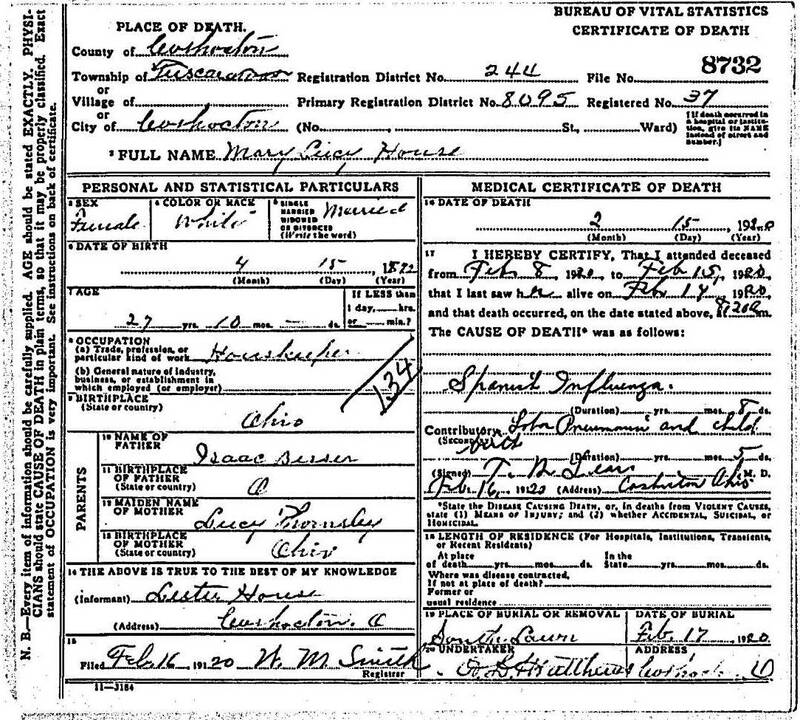 Born Alva Lester House on May 9, 1886 in Coshocton County, Ohio, he was the youngest of James and Frances (Ogan) House’s eight children. Somewhere along the line, he acquired the nickname of “Doc” even though he went by his middle name, Lester. Lester and Mary Lucy Besser, daughter of Isaac Besser and Mary Thornsley, were married on June 13, 1908. Lucy, as she was known, was just over 16 years old. On February 28, 1910 their first child, Arthur Joseph House, was born in Tuscarawas Township, Coshocton County. 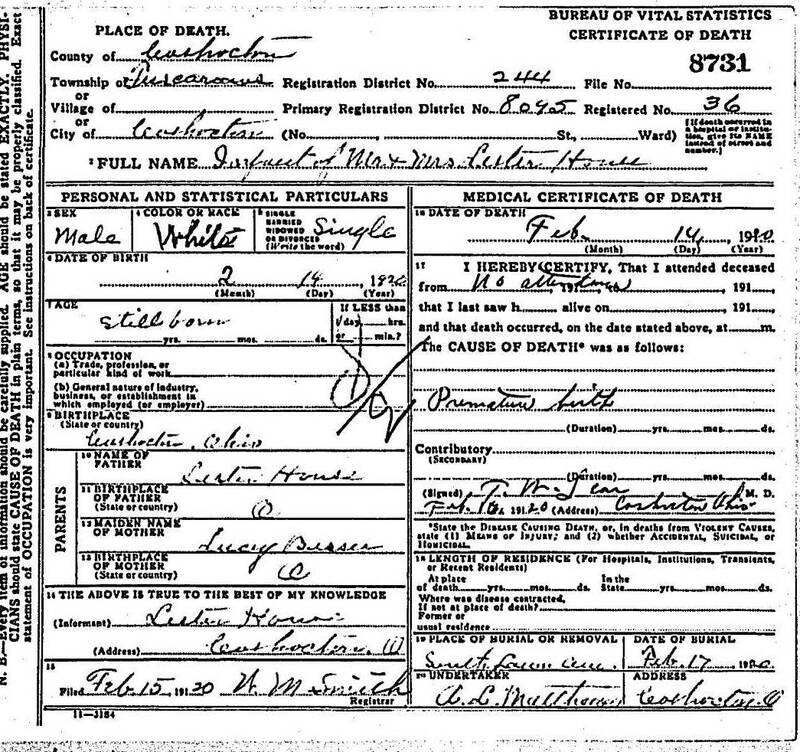 On April 16, 1910 the couple and their son were enumerated in the James E. House household living at 423 N. Eleventh Street in Tuscarawas Township, Coshocton County. Lester is working for a pottery company as a kiln worker, possibly at the Pope-Gosser China Company located on Seventeenth Street. Lucy’s mother, Mary Lucy (Lucy) and step-father, Noah Deeds, lived on the same street at house number 336. Lucy’s father had been killed in a coal mine accident when she was still a child. Four days after the census taker left, little Arthur came down with pneumonia. At just two months old, he contracted meningitis and died on April 29, 1910. Lester and Lucy faced their first tragedy as husband and wife. The baby was buried two days later in South Lawn Cemetery in Coshocton. Two years later, Esther Annie House, was born on April 7, 1912. 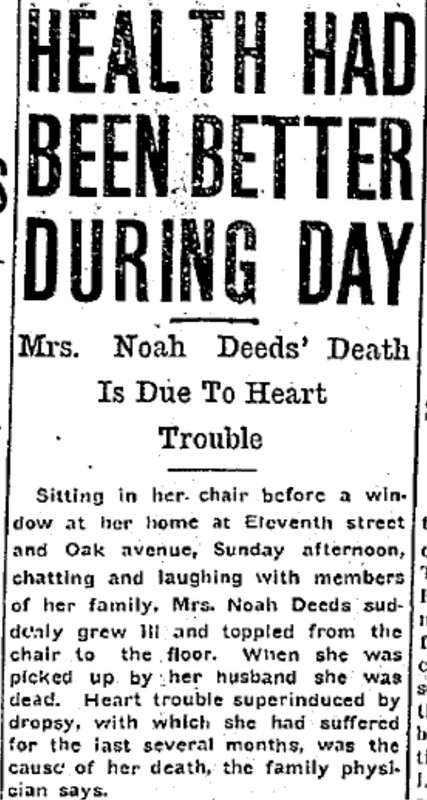 She lived only 18 hours before dying of lobar pneumonia. She was buried next to her brother in South Lawn Cemetery. Not but a little over a month later, as the couple were enjoying some time at the home of Lucy’s mother and step-father, Lucy Thornsley Deeds, fell out of her chair by the window of her home and died of a heart attack. The woman was about 42 years old. Once again, Lucy had to overcome a loss and wade through her grief. The couple finally had a child they could nurture when Georgia Evelyn House (referred to as Evelyn her entire life) was born on March 11, 1914. Their joy continued as a healthy son, Jarold House, was born two years later on May 26, 1916. Unfortunately the year previously, Lester had lost his mother, Frances (Ogan) House, to pulmonary tuberculosis. Lucy wasn’t in the best of health as the family had lived in Colorado about a year but returned to their hometown on account of her health. The family also lived in Dennison, Pennsylvania where Lester worked in the shops but returned to Coshocton in September 1919. 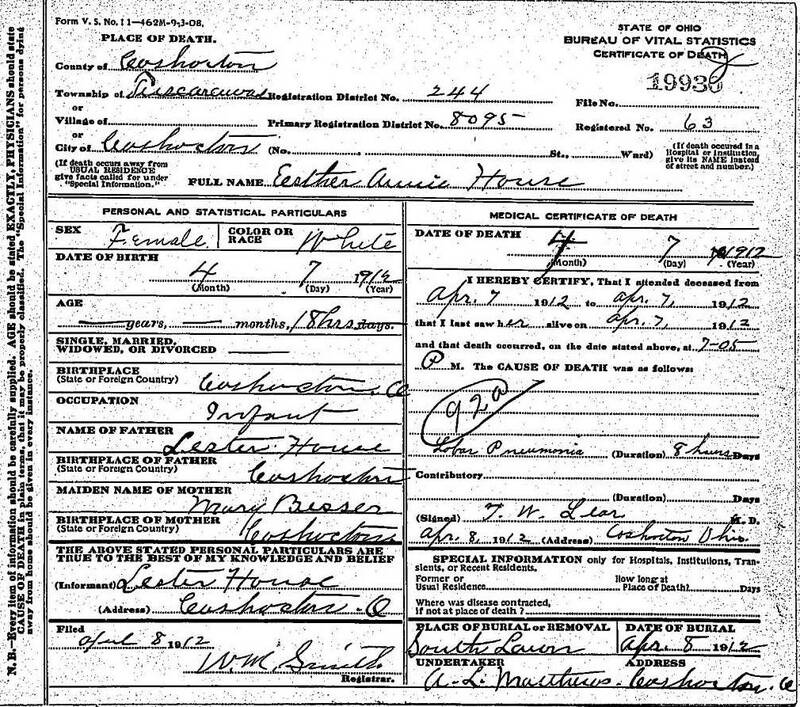 The 1920 US Census taken on January 8th, shows that the couple is residing, once again, at 423 North Eleventh Street with Lester’s father, James. 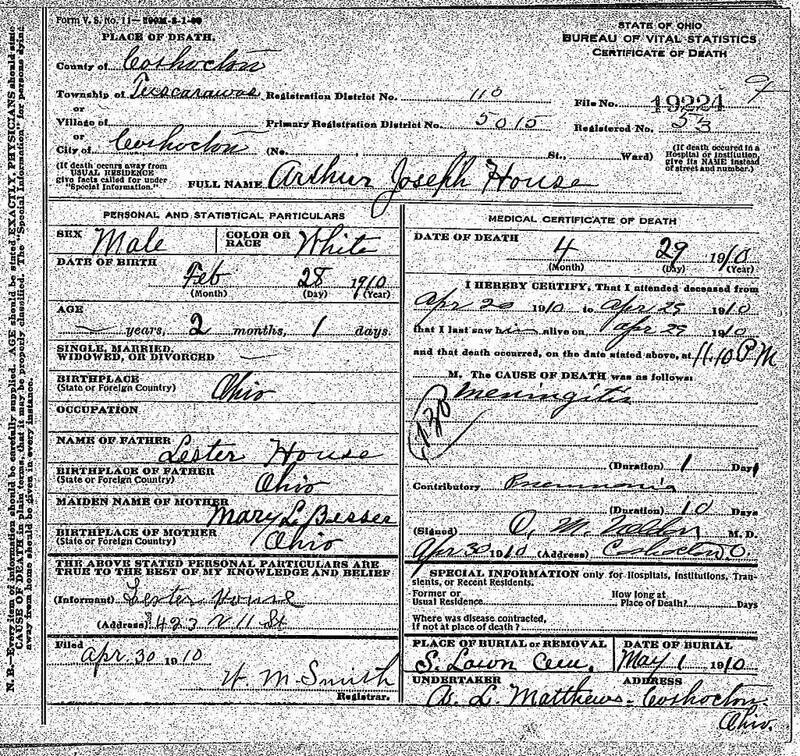 The census taker must have asked for the first name of occupants as they are listed as James E. House (head), Alva L. (listed also as Head), Mary L. (wife), Georgia E. (daughter), Jarold E. (son). There was also another child – one still unborn – as Lucy was pregnant. A little over a month later, the young mother contracted the Spanish flu, which had been the cause of a worldwide pandemic that had begun two years previous and would continue for several more months, then pneumonia set it causing labor. It is unknown how far advanced the pregnancy was, however, the son that was delivered on February 14th, was stillborn. Lucy died the following day. The baby was buried with Lucy next to the other two children, in South Lawn Cemetery. Lester had to pick up what was left of his family and move forward. His small children were also ill with the flu but would go on to recover. He had to move beyond his loss and grief. Part Two: How much more loss and grief can this famliy withstand? 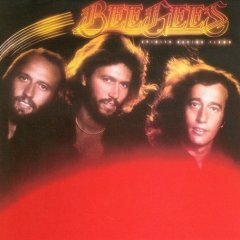 Last week, Tim Abbott from Walking the Berkshires posted a challenge that asked, What were the 10 most influencial albums of your formative teenaged years? I’ve read several genea-blogger posts and know that once I list the music that shaped my life as an adolescent, I’ll appear as the teeny-bopper I really was! See, told you – teeny bopper! The albums, I’d hear at least once a week & the singles – probably every day! In all fairness, I enjoy most types of music (just not behind country 100%!) Music has always been a big part of my life. My favorite morning is to put on some music, pick up a good book, pour myself a steaming cup of coffee and settle in to enjoy the music of my youth.